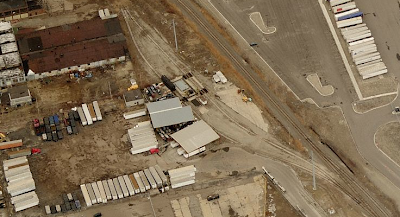 In the last post, we looked at the Highland Park Industrial track, located near the top edge of the Google Maps image to the right. 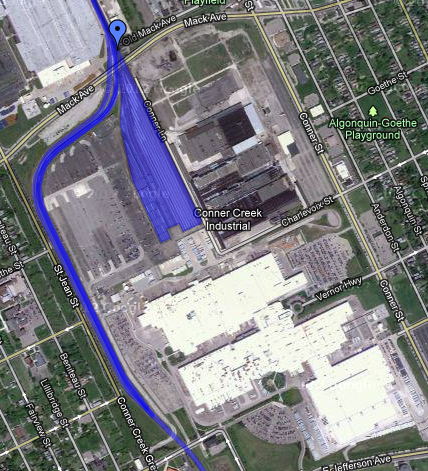 Today, we'll continue moving clockwise and talk about the Detroit Terminal East Industrial Track. This is the longest stretch of original DTRR trackage still in use by Conrail today. 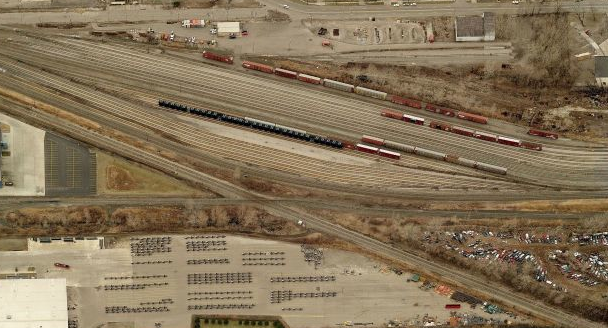 To the left is a Google satellite imagery showing a slightly closer view of the East Industrial Track. 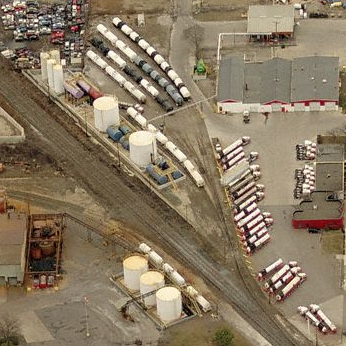 The line begins at the top left, at the same junction where the Highland Park Industrial track branches off from Conrail's North Yard Branch at CP Bonita. Once again, you may be able to see part of North Yard at the very edge of the photo. 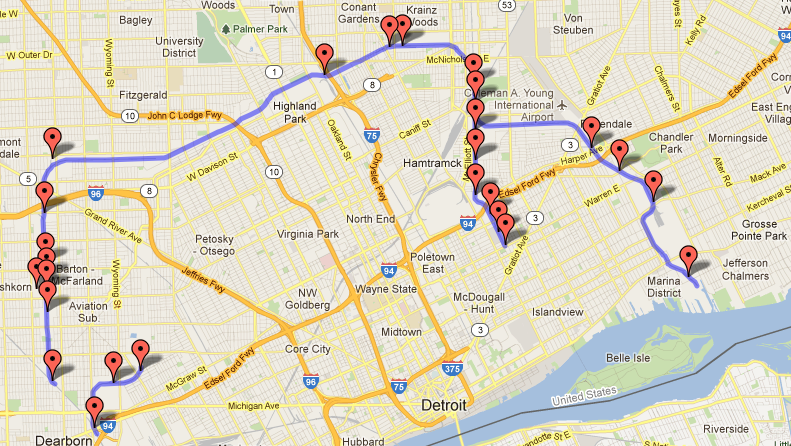 The Detroit Terminal rails go south at first, then curve eastward at the junction with the Belt Line Industrial Track. More on the Belt Line in the next post. The line then heads southeast, past the other PVS Nolwood facility in Metro Detroit. You may recall the other facility is also served by Conrail on the Union Branch west of the city. Next up is the Chrysler Jefferson North plant, which is the real reason for the existence of the East Industrial Track. This Chrysler plant is Conrail's largest customer in the Detroit area, according to a recent article in the October 2012 issue of Trains magazine. The line continues southeast toward the Detroit River, serving two smaller industries before reaching the water's edge. We're back at CP Bonita in the photo above, the intersection of North Yard (top left), the Highland Park Industrial track (top right), the North Yard Branch (bottom right) and the Detroit Terminal Industrial Track (bottom left). For reference, North is to the right in this image. Moving south slightly, there are a few interesting items to note in the image to the right. First, there's the small classification yard near the top of the photo, which is the northern end of North Yard. The tracks farthest from the camera appear to be RIP tracks, judging from the cars spaced out so that workmen can perform repairs. Second, there's the crossing just below the yard, where the East Industrial Track crosses the Canadian National Mount Clemens Subdivision. The East Industrial Track runs straight north-south, and the CN runs diagonally across. Once again, we move southward slightly (that's the East Industrial Track/CN crossing at the right) and we see the switch where the Belt Line Industrial Track begins. It continues directly to the south, while the East Industrial Track begins curving eastward. Moving a couple miles eastward, this is the old Hudson Motors Gratiot Avenue plant. There are rail spurs there in the weeds, but they've been out of use for a long time. 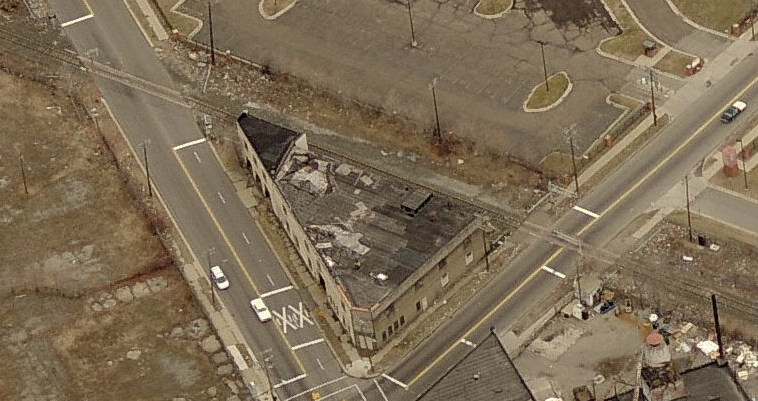 Right next door to the old Hudson plant is the PVS Nolwood plant, as noted earlier, the second of two in the Detroit area and both served by Conrail (or, in my version of reality, the Detroit Terminal). 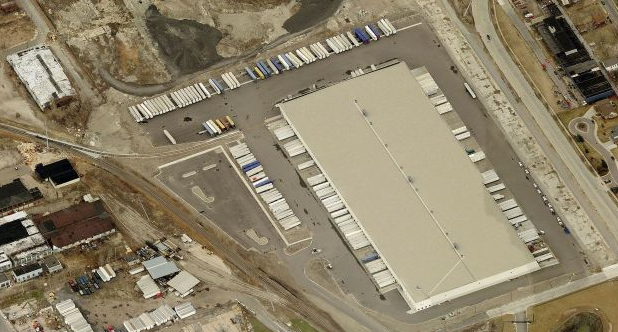 To the left is a Google satellite image in which I've highlighted all of the tracks serving the plant. In this overview, you can see the spurs on both sides of the main line. Above, you can see the complex switchbacks at the rear of the complex, and to the left, three additional spots just around the corner. Here's the other half of the PVS Nolwood operation on the east side of the Conrail main line. 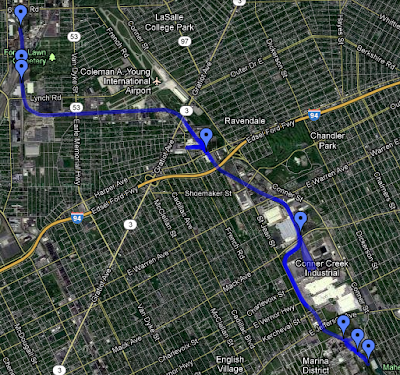 There's probably more trackage than on the west side, but it's less complex. What we have here are a couple load out spots next to the white storage tanks and a small yard to store and sort cars for the whole PVS operation. The way the whole PVS Nolwood operation fans out from the main line, this industry could be challenging to model. However, the operational complexity would make a big contribution to the overall operations of the model railroad, so this is a priority to include. 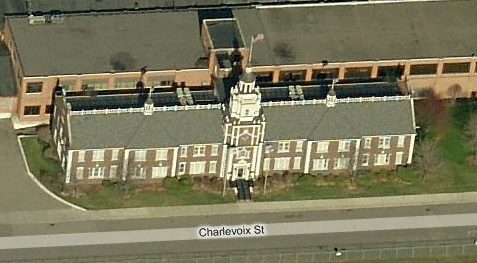 Continuing southeast toward the river, there is this neat triangular building at the intersection of St. Jean and Shoemaker. It may or may not have been rail served at one time, but that's not really the point. Given the space and time, it's going on the layout. Next up is Mack Yard and Chrysler's Jefferson North Plant. As noted earlier, this is Conrail Shared Assets' largest customer in Detroit. Jeep Grand Cherokees and Dodge Durangos are built here and shipped out to the rest of the world via autoracks. In the image at right, the factory buildings immediately to the east of Mack Yard are actually the old Budd Co. factory, most recently purchased by Thyssen Krupp and shuttered in 2006. One interesting note is that the original builder of this factory, the Liberty Motor Company, built a replica of Philadelphia's Liberty Hall as it's front offices. The building still fronts Charlevoix St. In the photo above, we're looking east over Mack Yard with the Budd plant just beyond. The first eleven tracks - those closest to the Budd plant - appear to be used for storage and some minor classification. The next eleven tracks - split into a group of four and then another seven - are dedicated to loading the autoracks. You can also see tracks curving away from Mack Yard to the west, which as you can see in the overview of the entire plant above, hem in the west edge of the Chrysler property. Two of the three tracks bordering the property appear to be used for storage, while one continues south. Here we have two industries. The large warehouse on the right is Syncrean U.S., and (barely visible) to the left is PSC Environmental Services. There's not much information out there about Syncrean, other than they specialize in logistics for the auto industry. This facility appears to be some kind of transloading facility, with a rail spur entering the warehouse at the north end, and truck docks all around. This is PSC Environmental Services, who provide hazardous materials clean-up, transportation & disposal. What you see here is what you get - a dilapidated storage building, a couple rudimentary metal shelters and two tank car load-outs. Easy & simple to model, and absolutely oozing character. This is definitely an industry I'd like to include on the Detroit Terminal model. 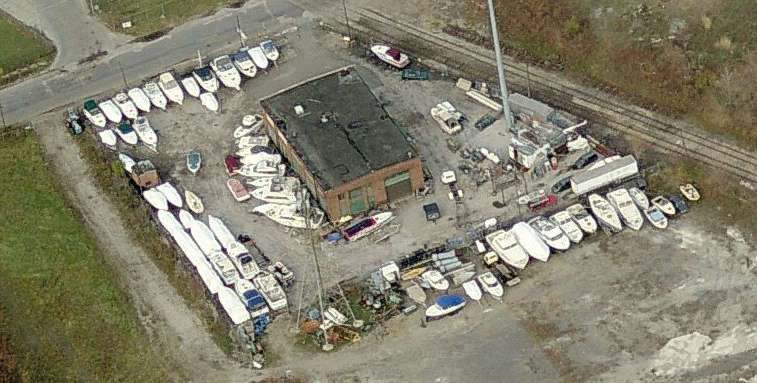 Before the rails disappear in the weeds at the edge of the Detroit River, we have this interesting little boat yard. As a sailor, this is another detail I'd like to model, given the space. With that, our tour of the Detroit Terminal East Industrial Track comes to a close. Next up, we'll look at the Belt Line Industrial Track.